Leaf is a responsive HTML5 template which will be a perfect solution for those who appreciate clean and minimalistic design. Leaf based website can be used for any activity you can imagine, from the non-profit organization to people creating their personal branding website. It is also based on 960 grid system. 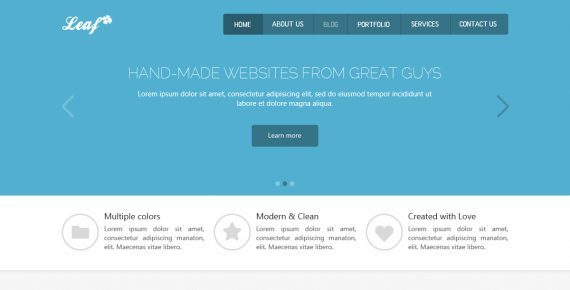 After the purchase, you will receive HTML template and 7 layered PSD files. Use your creativity to customize the layout, change fonts and colors. It is very easy to edit PSD layers (PSD sources consisted of 95% shape layers) or change CSS styles. Let people know about you and your business with Leaf! Images used in the preview files are not included into the release archive. All images are licensed under Public Domain CC0 (from Fotopedia).